A passing thought | carpe diem! 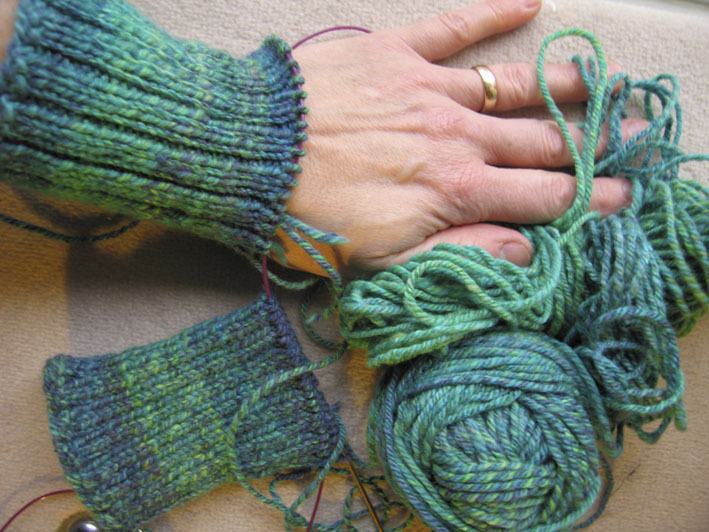 On the Ravelry group where I seem to be living at the moment, there’s a thread for the ‘Year of Making Stuff’. In it we egg each other on to greater feats, and enthuse, and feel inspired even while turning pale green with jealousy at some of the items some of us make. We’re all making beautiful things, and learning new ways to make beautiful things. Sara Lamb’s book Woven Treasures: one-if-a-kind woven bags inspired me to try pick-up weaving. It’s a folk weaving technique, the sort of thing people have been doing for thousands of years to enrich their lives by making everyday objects a little more beautiful. As I reached into the sewing box to find a needle to finish the ends of the band I was struck by the way I took those needles and my other odds and ends for granted. I don’t know what brings these thoughts to mind. They’re not random, they’re always related to something I’m doing. Usually something that people just like me, my ancestors, have been doing every day for longer than I can think about. Baking bread, boiling water, spinning. I am so fortunate. I don’t have to grind grain and gather wood to fire an oven for 3 hours to bake bread for an entire household for a week; I just buy flour and turn on the oven. If I want a hot drink, I turn a tap to get fresh, safe water that boils in minutes at the flick of a switch. 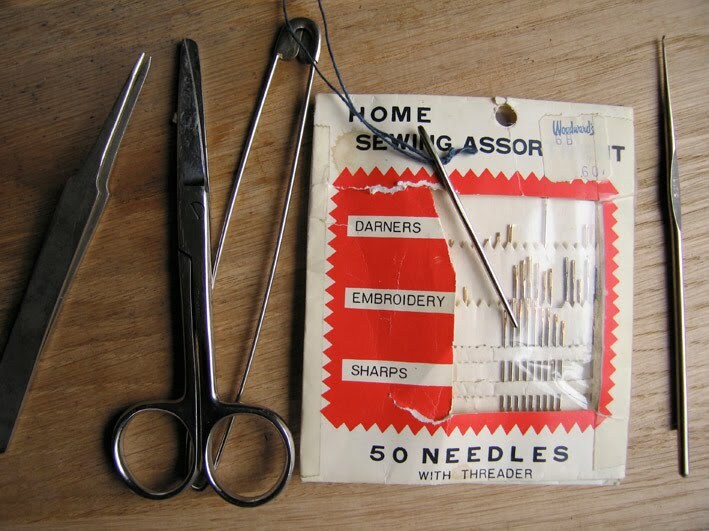 If I want a needle, I take one from the packet I bought more than 20 years ago in Canada. For 60 cents I had 50 steel needles, incredibly sharp and fine, suitable for a variety of uses. I still have lots because I sew as infrequently as possible (I dislike fine sewing, so it’s just as well I can buy ready-made clothes). By contrast, a thousand years ago, this one needle would have been someone’s prized possession. Most people used bone needles. Even in the Middle Ages, metal needles were nothing like those in the packet I take for granted. Not to mention the crochet hooks, the scissors, the safety pins and dressmaking pins so cheap they’re used in packaging the clothes we buy. To be thrown away, or sworn at when an overlooked pin finds its way into flesh as well as cloth. After pausing to consider my good fortune, I did my best to finish the ends of my first pick-up band. 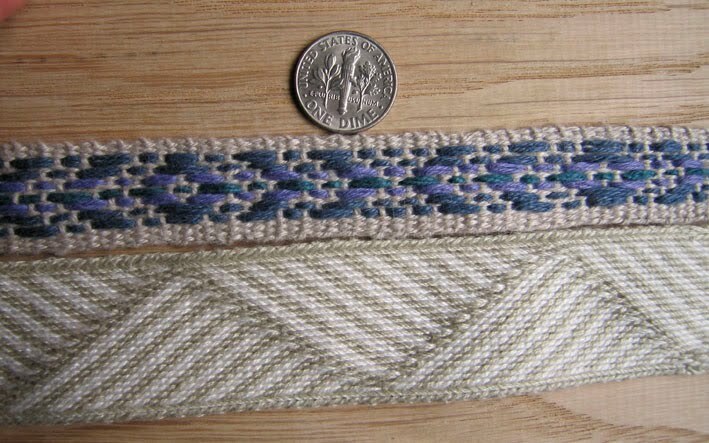 It’s shown here above my first complex tablet-woven band. That tablet-woven band is a sad sight: now a bookmark, it was meant to be much, much longer, long enough to be a belt. But after spending several hours over the course of a week or so getting to grips with the diagonals, I worked out how to make the diamond ‘eye’ at right… and then, for some reason, I had to put the loom to one side. I did make some notes about what I’d done, but by the time I got back to it I’d lost the knack of doing the diagonals, and I think some of the tablets had been rotated by accident. That strip and its warp sat on the loom for the next three years, reproaching me. Occasionally I’d try to work out how to get back to the diagonals, fail, and put it to one side again. Until a month ago when, after another afternoon spent staring thoughtfully at it, turning tablets to and fro, I took Denny’s advice and cut the dog off the loom. I can make another one. It is, after all, the Year of Making Stuff. And I have been making stuff. There’s been quite a lot of spinning, some of which is being knitted. 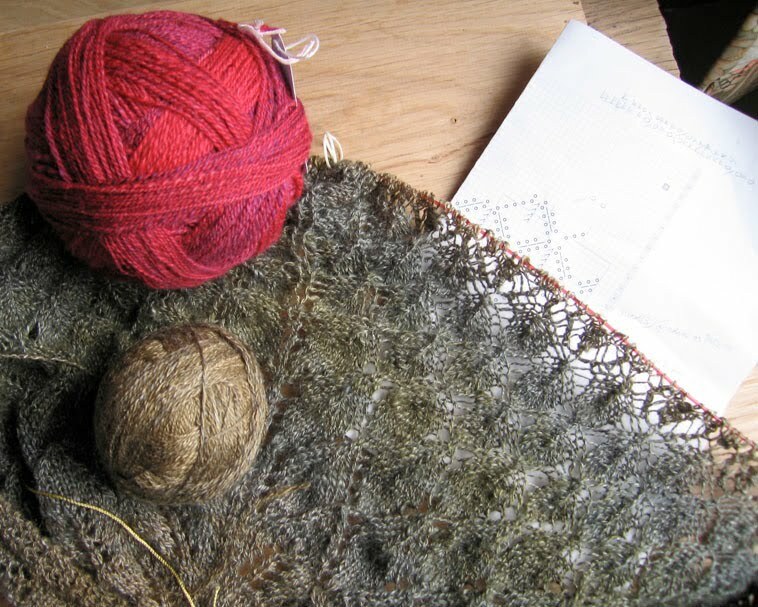 The 400m of cashmere/silk is becoming another shawl based on the Rampton Lace Swatch pattern. 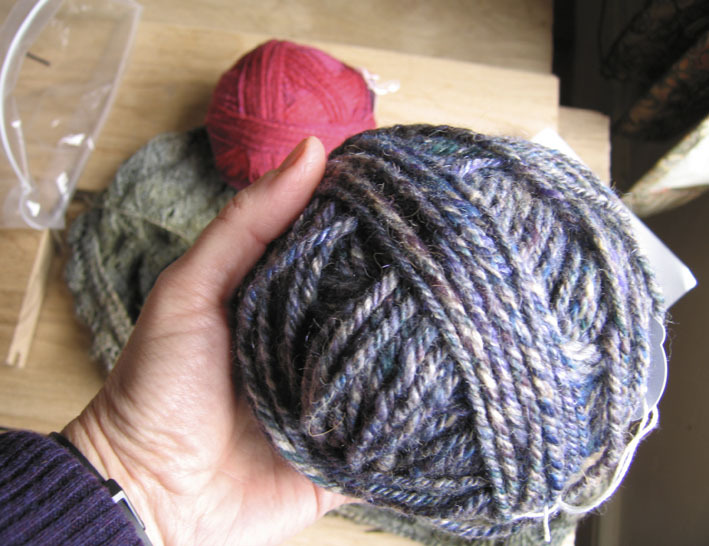 It’s become overly difficult for a beginner, so that ball of Jo’s red merino/silk will become yet another version, with the complex ending of the green as a variant for more knitters willing and able to keep an eye on the orientation of their YOs. I can’t knit that lace AND remember to write down what I’ve done after wine, or when I’m tired, so I need some simpler knitting as well. became a bouncy woollen 3-ply that I think will do nicely. Can you see the firestar in it? My new hat will *sparkle*! 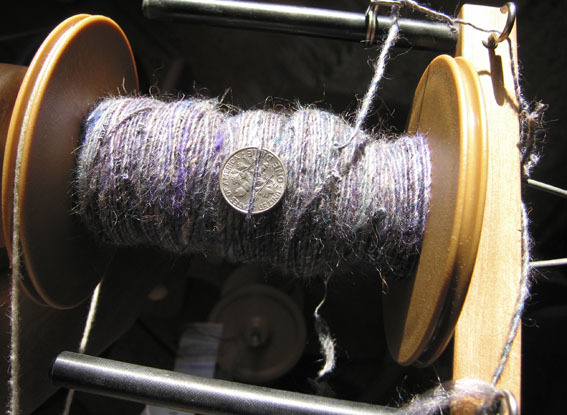 There is of course more spinning occurring; 2 oz of Switzer-land alpaca from SOAR on the Suzie. I’m practicing long draw because after I finish that it will be time to compete in the Ravelympics. My chosen project? Spin cotton warp and weft for a small bag, then weave it on the Schacht ‘Flip’ rigid heddle loom that hasn’t yet arrived. We’re getting close to the wire here. I need to know the grist I need to spin! 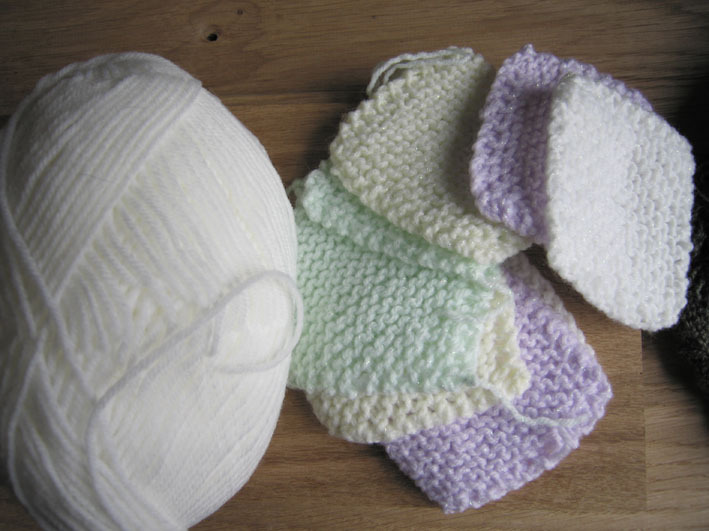 In the interim, I also have to work out how to crochet a friend’s knitted squares together to make a baby blanket. When I finish *that*, there’s the Christmas present that arrived last week. 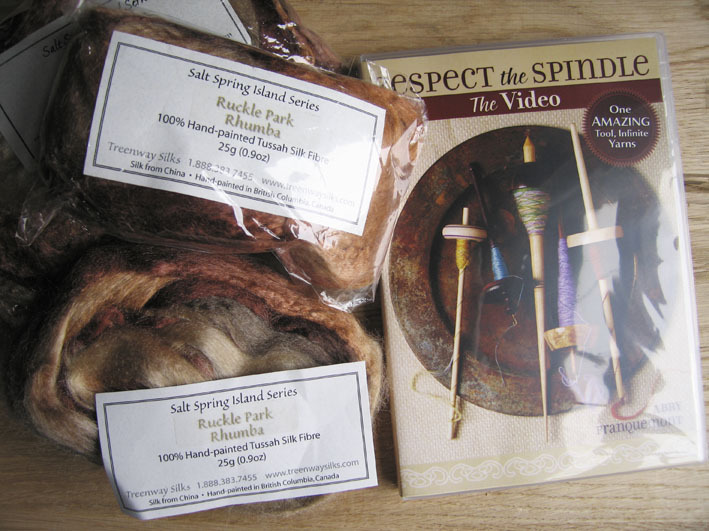 I wonder if the fates are telling me to spin that 100g of silk on a spindle? that’s roughly 34 m^2 of solid oak floorboards to replace the worn and maltreated pine that is our current downstairs floor. Spinning wheel and cat for scale. That’s a lot of work even starting with the boards made by someone else. I’m hoping for warmer weather for the project, because there’s a chance that we’ll have to mess with the central heating pipes and radiators to get some of the old boards out. The snowdrops know the sun is moving north once more. If by any chance I have time to feel bored, I will warp the loom for another tablet-woven band. This entry was posted in Uncategorized on January 24, 2010 by sarahw. There's no way you could ever get bored! 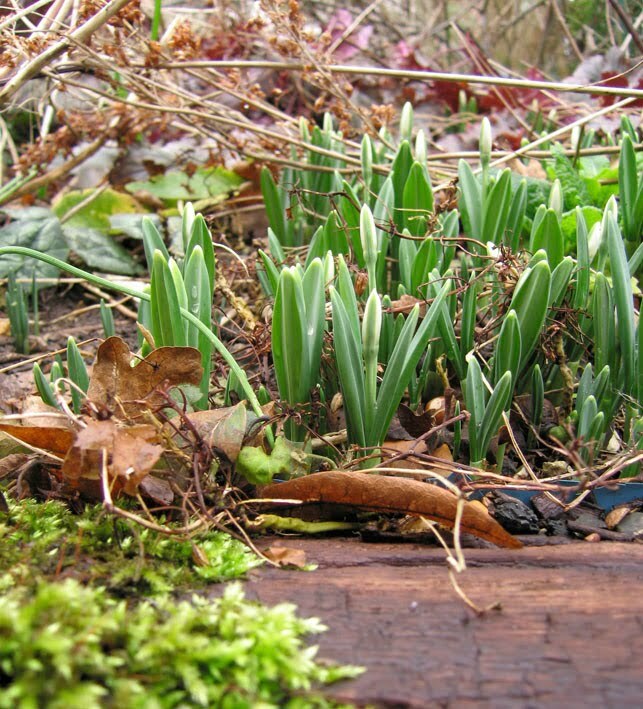 And I'm jealous of your snowdrop buds; I won't see mind for at least two months. The only sign of spring around here is the unfurling leaf on the fig in the back room window. This year of making stuff really is off to a great start, isn't it? Yeah, the yarn is pretty too. I really like that ball for the hat. I really want to learn how to do the patterns in weaving. I'm usually content with having the colors and textures do the work in my plain weaving, but that's really something. All of you folks with real full-time jobs, and you get so much done! I really must work harder and develop that attitude of knittingfiddler, who simply must feel useful when she isn;t earning money (I tend to clean, which is always useful and sorely needed but not creative.) I have a buttload of spinning tp try to get through before I leave NYC, so perhaps that will serve as a jumpstart. All of your accomplishments are lovely, as always. There are a slew of different things I could comment on in this post, but I'll just say that that 3ply looks great and that I love that your sewing notions include dissection tools. 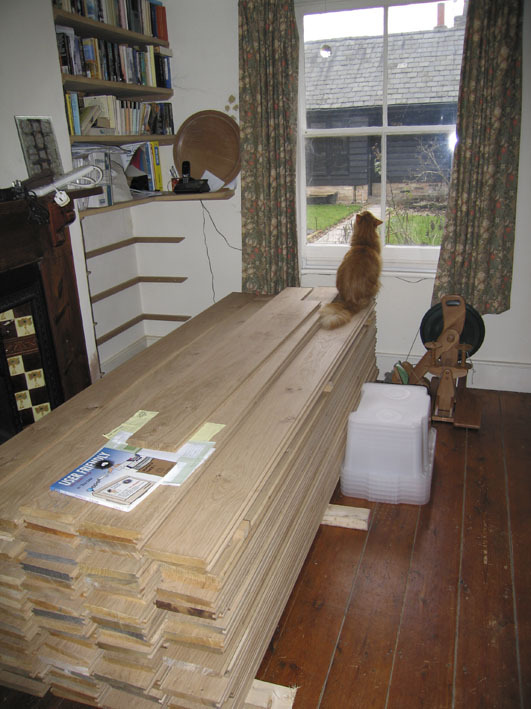 Best of luck with replacing the floor boards (beautiful cat for scale!). What keen observations about everyday, taken for granted things.